Today’s lesson might be a little shocking for some of you, especially because it’s coming from me, someone who talks a lot about personal development. Why shocking? Because today’s episode is on a book that pretty much disrupts a lot of the self-help genre. The self-help genre covers subjects like motivation, how to be happier, how to be more productive, the importance of goal setting, basically, self-help books teach us how to be better humans. I talk about a lot of these topics here on the podcast, and I do think there are valuable lessons to be learned. But… like I said, the book I read for today’s episode is different. 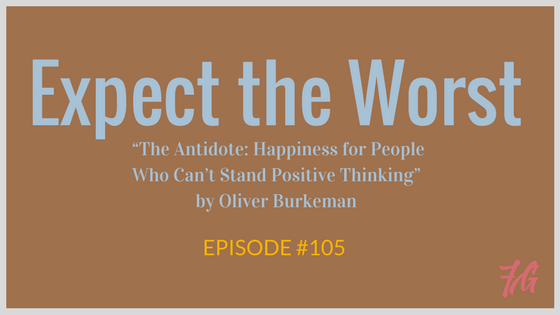 The name of the book is “The Antidote: Happiness for People Who Can’t Stand Positive Thinking” by Oliver Burkeman. If you’re someone who thinks that all the self-help books on the power of thinking positively, and books like “The Secret” are garbage, well, you’d love this book. And… if you’re like me, very open to different perspectives, philosophies and different approaches to life, you’ll also find some value in this book. You can find out more information on the book “The Antidote” right here. And download the complete audiobook version of this book for free, by clicking here.